This is my first year eating kohlrabi, thanks to my CSA farm share. I wonder where this vegetable has been all my life! It’s like it just appeared out of nowhere. I have only just begun to explore the possibilities of kohlrabi but so far I am quite taken. Fresh, the texture and water content (though not flavor reminds me of jicama. You can shred it, dip it, put it in a salad, whatever. Cooked, however, it takes on a totally different quality. It firms up like the center stem of a cauliflower and takes on a very mild flavor easily associated with a cruciferous vegetable. Mostly Ive been using it as one of my lunch time sautee vegetables. I have also grilled slices of it with eggplant and topped them both with olive oil and fresh basil. 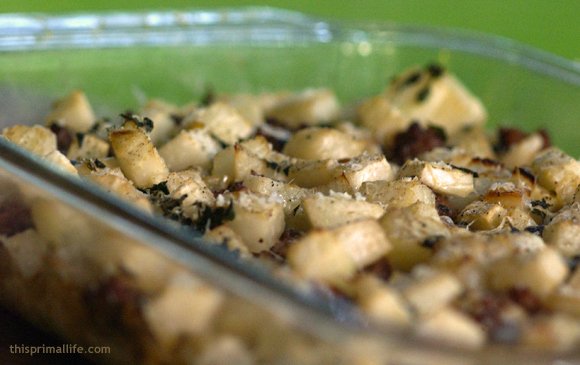 In this recipe the kohlrabi is cubed and cooked casserole style. If you dont eat dairy, look away now. I cant think of a good substitute for the cream. I have made this several times and have mixed in other vegetables with the kohlrabi with good results. Any sturdy vegetable would work well. I have also mixed in raw chopped collard greens. Another idea is to top the whole thing with cheese (such as parmesan and finish it off in the broiler to get a nice browned top. This recipe is adapted from the Kohlrabi Ham Bake at Simply Recipes, one of my favorite recipe blogs. Sautee the onion, kohlrabi and thyme with the butter in a large pan until the onion softens, about 10 minutes. Meanwhile, beat the yolks in a bowl and whisk in the cream, starch, nutmeg, salt and pepper. Add the sausage to the kohlrabi and onions and transfer to a 9×11 in casserole dish. Pour the cream and egg mixture over the kohlrabi and onions. Bake for 30-40 minutes. Great recipe! I too, have recently discovered this wonderful veggie. I planted some in my garden Saturday in hopes that they will overwinter for me! I hear they grow like radishes, which is a good thing! Hopefully I can get the timing down well enough to have a good supply of them. I love to use them as a stand-in for potatoes and this dish you’ve made looks stunning. I’ll wait until more comes in my CSA bag….hopefully soon. This looks delicious. Do you really put the sausage in raw, though? You don’t cook it before it goes in the oven? Carrie – I didn’t know how they grew. I think I may try planting some, too! Crunchysue – Cook the sausage first. The ingredient list says cooked sausage but maybe I should have reiterated that in the recipe instructions. Doh! Sorry, I missed the “cooked” part in the ingredient list. Thanks for pointing it out. BTW, I had my first kohlrabi today, in the form of raw slices. It’s my new favorite. Tastes like fresh peas to me. I use coconut milk as a substitute for cream and milk. Works well! Also, tropicaltraditions.com has a coconut cream that I’ve been meaning to try. You add water to it to make it the consistency you want, so you can make it thicker (cream) or thinner (milk). Oh, MAMA, this looks and sounds DELICIOUS! I have never tried kohlrabi, so this will be a first for me. I am new to all this — is dairy OK…or is this something you choose personally to go ahead and keep in your diet? @katydid: I have written down the info on where to get coconut cream. Thanks for this. Melt the butter in a medium saucepan over low heat. Add 1 minced onion and cook gently, stirring occasionally, until just soft – about 5 minutes. Add the flour and stir to form a paste, for 1 minute. Slowly pour in the milk, whisking or stirring constantly. Add in the mustard, and season to taste with salt, pepper and nutmeg. Simmer 10 minutes, stirring occasionally. Set aside. Preheat the oven to 180Â°C/350Â°F/gas mark 4. Heat the oil in a large saucepan over medium heat. Add the kohl rabi and 2 chopped onions, and sautÃ© until just soft. Add the carrots, lentils, potatoes, garlic, and water. Bring to the boil, cover, reduce heat to low, and simmer 10-15 minutes or until the water is absorbed. Combine with the white sauce and parsley. Season to taste. Transfer the mixture to a large shallow oven dish. Combine the cheese and breadcrumbs, and sprinkle over the top. Bake 45-55 minutes, until the top is golden and the vegetables are soft.